Wine: Since I moved to Greece, I have been mainly drinking the house wine at restaurants that comes in 1/4-1/2 liter pitchers that has varied in taste from rotgut to somewhat better than rotgut. If you have not figured it out by now, I am cheap. Last weekend, I went out looking for a place to exchange dollars to Euros. It was Sunday night and rainy. After walking endlessly, I stumbled upon a tourist restaurant. I was wet and tired and did not care. 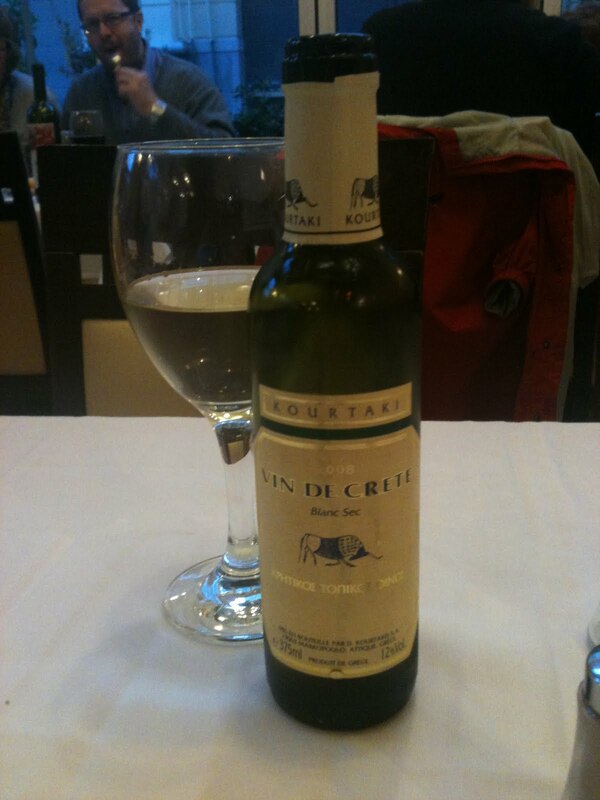 There was no house wine so the waiter suggested a 1/2 bottle of Vin de Crete by Kourtaki. I knew nothing about the wine but thought Crete's hot and dry climate should be ideal for white wine so I readily agreed. Vin de Crete is said to be a "country wine" from the hills of Central Crete using a native grape called the Vilana. Tasting: The wine was a half bottle served chilled and eaten with fried calamari (really good) and lamb chops (pedestrian). Kourtaki's Vin de Crete 2008 has 12% alcohol. Result: The Vin de Crete had a dry and fresh taste. It tasted out of the barrel in a good way. The Vilana had a slightly wetter taste than a crisp Sauvignon Blanc. The wine was golden in color, clear, and medium-bodied. There was a taste of sour apple, like a Granny Smith. The wine was delightful with the calamari. Grilled sea bass is popular here. The Vin de Crete would go perfectly with the sea bass. Price value: 8.50 Euros for a half bottle in the tourist restaurant was probably two to three times the street price. My guess is that it is a very good buy.